J.B. Smith, who has been harvesting alewives in Damariscotta for five or six years, inspects an alewife on May 14. 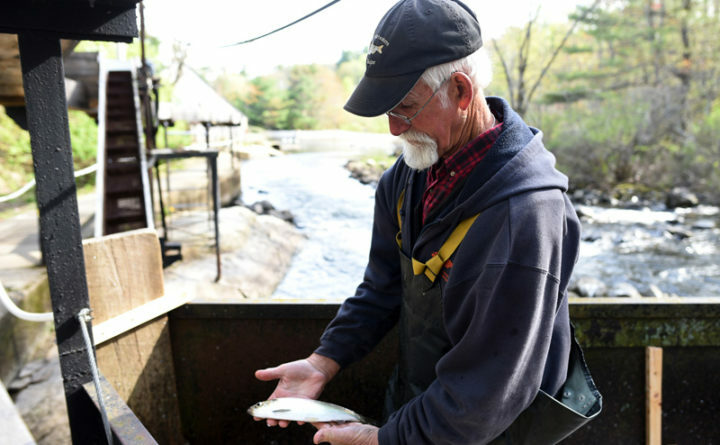 Thousands of small fish are making their annual voyage through the Damariscotta Mills fish ladder, risking sea gulls and fishermen on the climb to Damariscotta Lake, where they will spawn. The fish can choose two paths. One leads to a waterfall, the other up the fish ladder to the lake. The fish, which normally live in saltwater, migrate to the freshwater lake to spawn. The fish that get caught in the waterfall area are the ones that are harvested. “It has started out well,” Kurt Oehme, who has been harvesting alewives at the ladder for the past seven years, said of the run. The alewife run has begun about a week earlier than it did last year, according to J.B. Smith, who has been harvesting the fish at the Mills for the past five or six years. The ladder will continue to teem with the fish for at least another three weeks. The harvesters bang a metal rod in the water to frighten the fish into a lift, which takes them out of the water. The harvesters then guide the fish onto a conveyor belt, which brings them to an area where the fish are put in trays for sale. Most of the fish coming through the fish ladder are at least 4 years old, according to Smith. During harvest, scale samples of the fish are sent out to learn more about their age. The oldest he has seen there was about 9 years old. The alewives are harvested on weekdays from 5-7 a.m. and 4-6 p.m., depending on how many fish there are, according to Smith. Trays, which hold more than 2 bushels of fish, are sold for $50. Each tray can provide bait for more than 100 lobster traps, according to Smith. Alewives are popular bait for lobster fishing because of how long they last and how fresh they are, Smith said. “In the springtime, they like something fresh,” Albert Lane, a lobsterman who was purchasing alewives, said of lobsters. Lane has been fishing for the past 50 years, since he was a kid. He currently fishes for lobster out of Pemaquid Harbor. The fish that make it to the lake are counted and, according to Smith, just under a million alewives made it into the lake last year. According to the Damariscotta Mills Fish Ladder Restoration website, all revenue from the harvest goes toward maintenance of the ladder. An 1807 state law directs a portion of the harvest to the poor and destitute, according to “Newcastle History” columnist Arlene Cole. In 1839, Newcastle and Nobleboro voted that all widows would receive 400 alewives if they wished. Today, widows can apply to receive 2 bushels of the fish, according to Cole. The annual Damariscotta Mills Fish Ladder Restoration Festival at the fish ladder will take place from 10 a.m. to 7 p.m. Saturday, and it will include music, food and activities.